Turnberry Ocean Colony is one of the premier private clubs in South Florida. If you are among the elite, you will find the living at Turnberry Ocean Colony to be similar to living in a full service paradise similar to Mar- A- Lago. Comprised of two towers, North and South, Turnberry Ocean Colony also holds a 5 star hotel. It is located directly on the Atlantic Ocean and is in the heart of Sunny Isles Beach. Each tower has 27 floors with a variety of floorplans. Residences range in size from 2,235 square feet to 5, 690 square feet from 2-5 bedroom floorplans. To consider this project a full service building would be a grave understatement, this is an entirely different way of life. 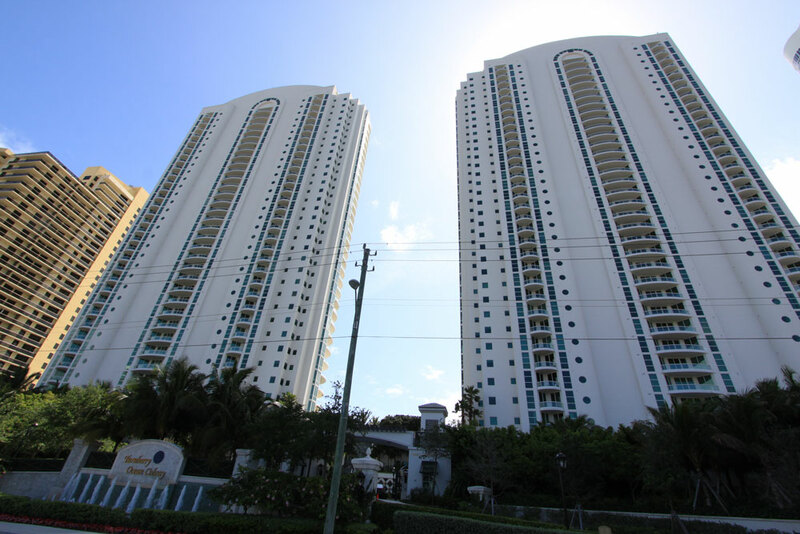 There are only 4 residences per floor in the two twin towers at Turnberry Ocean Colony. It sits on a massive 650 feet of the Atlantic Ocean, and the beaches are famed for the soft white sand. Turnberry Club features and amenities include 35,000 square foot private club, state of the art fitness center and spa, in house physical trainers and masseurs, exercise programs which change seasonally, limosine service, beverage and food service by private pools and cabanas, cocktail lounge, gourmet and casual oceanfront dining, card room, and beauty salon. All residences are similarly equipped with luxury including imported marble fixtures in baths, steam shower and Jacuzzi tubs, state of the art gagganau appliances in the kitchens with imported cabinetry and finishes, and floorplans that maximize space and allow for maximum enjoyment of the stunning views. Naturally, residences also have floor to ceiling windows and ceilings starting at 10 feet. Spacious Balconies are spacious enough for al fresco dining and cooking. Sunny Isles is a diverse city located on a barrier island northeast of Miami contains cafes, boutiques, and gourmet dining in an unassuming setting. The area was designated a tourist destination as early as 1920 and with the completion of Haulover Bridge in 1925, it has grown to be an international destination. Developers favor this area and some of the world’s most acclaimed architects and builders vie to break ground on oceanfront condominiums from Micheal Dezer to Donald Trump. It is a short distance from the opulent village of Bal Harbour to the south and to the north, Aventura. Sunny Isels Beach is equidistant from the Miami International Airport and the Fort Lauderdale International Airport as well as a number of executive airports. From shopping to dining, Sunny Isles is a premier destination for the elite.